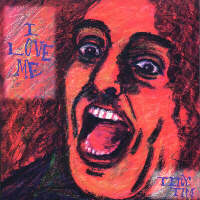 TINY TIM: "I Love Me"
When Fot Records/Home Recordings owner Steve Rubin asked Pink Bob in 1993 if he'd be interested in taking on a Tiny Tim CD, Pink initially thought he was joking. He wasn't. Steve took care of all of the business aspects of the project, and Pink was given the legendary ukulele star's phone number. After several mind-bendingly long conversations over the phone, Pink had compiled a list of ancient recording artists (and heard Tiny Tim's rendition of them over the phone sung loudly from his Des Moines hotel room at ungodly hours of the morning). A few trips to the local libraries turned up many of them, and for weeks he actually drove around McLean County in his Mazda with Al Jolson and Bing Crosby drowning out the farm implements and honking minivans! Tiny showed up at Sedistudio Lexington for two full days of recording, both multitracked material Pink had prepared and stream-of-consciousness solo DAT offerings. After some much-deserved rest, Steve and Pink poured over what they had and couldn't help but noticing they were quite short of a proper-length CD release! Steve set out to find what rarities and short-run indie 45 releases he could license, and Pink decided to put together a special version of The Sediments to flesh out their half of the CD. One of the people Steve had met in Chicago was an amazing multi-instrumentalist named Winston Damon, who could play everything from percussion to woodwinds to brass at virtuoso levels. Winston was brought down for a number of sessions and contributed quite heavily to the arrangements of the Sediments-backed tunes. Long-time Sediments contributor Tommy O'Donnell also came out for a number of overdubs, and brought his brother Jimmy (also from Chicago) in for the fun. Pink Bob's wife Shawn even added some clarinet to The Star Spangled Banner! Notable guests included infamous home taper R. Stevie Moore (on "She Left Me With the Herpes") and Eugene Chadbourne (master of ceremonies for the wonderfully demented "Depression Medley"). Needing additional hands, ears and equipment for the mix, old friend Tim Thomas was brought in to put the finishing touch on things. Sadly, Steve Rubin died of cancer in 1994 before the project was completed. Shelved for another year, the CD was finally released on Negativland's Seeland label with the addition of a handfull of tracks from the fabled "Wedding Album" sessions in Minneapolis. Prior to the master musicologist's death on November 30 1996, he confided in Pink Bob over the telephone that he felt that "I Love Me" more than any other release showcased the breadth of his musical interests. He was still slightly befuddled over the "Depression Medley" featuring the long-distance duet of himself and Eugene Chadbourne (whom he'd never heard of! ), but, when Pink pointed out it was his own personal avant garde "Revolution #9" statement, he laughed. "Mr. Pink Bob, you thought of everything for this one!" Produced and Engineered by Pink Bob. Mixed by Pink Bob and Tim Thomas. Mastered by Pink Bob at Sedistudio Lexington. Front cover drawing by Shawn Harper. Additional artwork by Richard E. Deutsch.